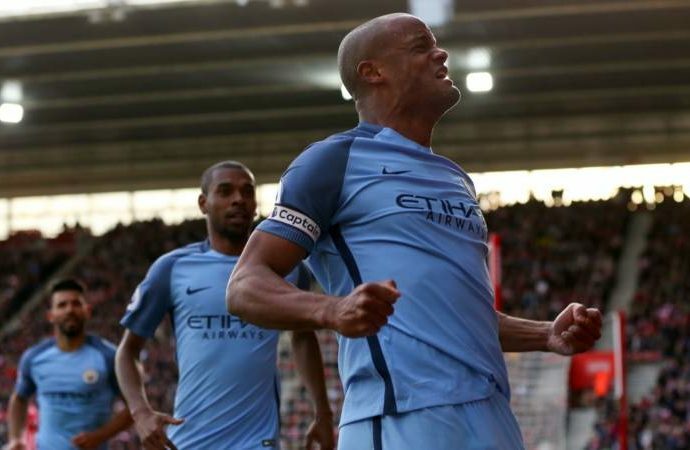 Manchester City moved into third place in the Premier League as Vincent Kompany scored to spark a 3-0 win at Southampton. Sergio Aguero threatened twice in the opening few minutes as City started at pace, first volleying a difficult half-chance wide from Kevin De Bruyne’s pass and then turning his defender and sending a low, angled shot spinning wide. But for all City’s early dominance of possession, Southampton created — and missed — the best early chance after 15 minutes. Nathan Redmond tricked his way into space before finding Manolo Gabbiadini with a pass into the area, but the striker’s layoff was thumped high over by Dusan Tadic when he had both time and space. City swept forward as the game approached the half-hour mark and David Silva found De Bruyne, whose strike from the edge of the box cannoned back off a defender. Silva should have given City the lead with 37 minutes gone when Aguero’s deflected cross came to him and, from close range, he could only prod his finish into the side-netting. City felt they should have had a penalty two minutes later when Southampton goalkeeper Fraser Forster came out to meet Leroy Sane and appeared to catch the City player as he attempted to round him. Referee Neil Swarbrick, however, waved the appeals away. Silva was involved again as the clock ticked down to the end of the first half, firing wide from the edge of the box as the opening period ended without a shot on target for either side. City’s Yaya Toure provided the first on-target effort early in the second half but his effort posed no threat to Forster, before James Ward-Prowse curled an ambitious free kick over the angle of Claudio Bravo’s goal. With 55 minutes gone, Jesus Navas let fly from 20 yards but his effort was close to Forster, who tipped it over — only for City to take the lead from the resulting corner as the returning Kompany thundered home a header. City were controlling the game and De Bruyne looked to add a second, firing well over before his deflected ball into the area fell to Silva, whose low effort hit a defender and span behind. Southampton could have levelled after 74 minutes when Maya Yoshida powered a header too close to Bravo, but four minutes later they were out of the game thanks to a brilliant City goal. De Bruyne broke through after some slick interpassing with Silva and, after reaching the penalty area, squared for Sane whose low first-time finish doubled the visitors’ lead. Two became three soon afterwards when De Bruyne looped in a cross from the right and Aguero thumped home a header.